Knowing the right contacts not only makes things easier, it can make (or save) you money. Gain access to our personal Rolodex of experienced factors that took years to develop. Work direct with knowledgeable investors, educators, and mentors. Top factoring companies for small to medium receivables the big guys turn down. 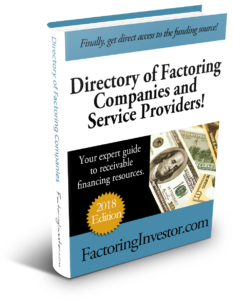 Updated listings for over 80 factoring companies including email, phone numbers, and websites (with easy one click access). This directory alone could save you hundreds, even thousands of dollars when you go to sell an invoice or broker an accounts receivable funding deal.